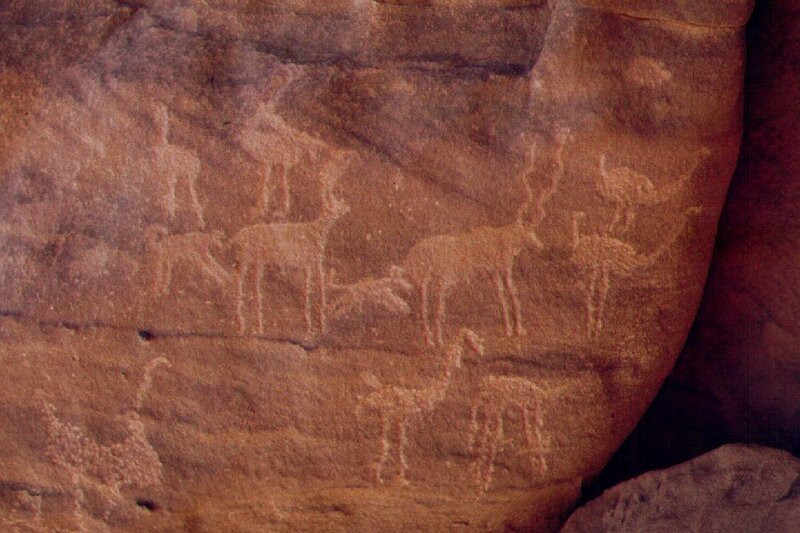 Early Rock Art at Karkur Talh, showing an addax, many ostriches, African wild dogs (or possibly hyena), and a gazelle. ...as Baxajaun could tell the weather, as Polyphemus, many voiced, kept sheep in cave, as red-haired Seth was god of storms, as curly-tailed dogs become Pharoah, as Anubiscuit is Xolotl Evening Star, as UeCaillech is Winter White and Mother Hecate bagpipe Venus, as Egypt is Ueue Tlapallan/Old Red and Nile the Styx, as Neandertal Toniti heads west to Tlalocan whose paradise is Deer. Polyphemus is lives in a cave with sheep and goat. He ends up eating several humans. Some aspects of this UeCaillech/Beira myth remind me of the Greek myth of Persephone and Demetra. I often wonder what experiences the ancients were trying to pass along. I suspect that the most enduring myths are ones that resonate with life experiences. I do suspect that stories such as Noah's Ark and the Crossing of the Red Sea are quasi historical accounts of climate events such as the Younger Dryas or rapid increases in sea level rise. Similarly, there are some Native American myths that describe a genesis in an icy world and could be interpreted to record the ice age. I don't know much about Aztec myths, so your reference to Tlalocan as having a paradise with the deer is very interesting.